Cambridge Audio CXU review | What Hi-Fi? Cambridge Audio is on a roll. Its new CX series line has proved hugely popular in our testing rooms, with the CXC CD transport, CXA60 amplifier and CXN music streamer all receiving five stars for their combination of great design and superb performance. The Cambridge CXU, a multi-talented universal disc player, is the latest to join that illustrious list of five-star products. Packed with features and connections, the CXU is an impressive player of films and music. Although £900 may seem steep for a disc player, the ‘universal’ part of the CXU needs to be considered. The CXU isn’t just a Blu-ray/DVD player. 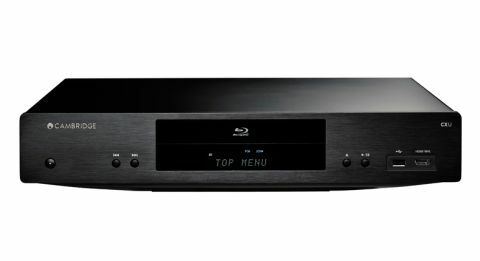 It’s a Blu-ray player, CD player, DAC and network streamer all built into one sleek machine. The CXU also supports high-resolution audio, whether it’s in SACD or 24-bit/192kHz form, and it will charge your smartphone too. Suddenly, that price looks pretty reasonable. The CXU follows in the footsteps of the CX family with a sleek, premium-quality build and ‘floating’ design. It’s a robust yet elegant chassis. The aluminium finish (in black only) looks smart, and there’s real care given to the way the buttons on the unit feel, and how disc loading tray operates seamlessly with as little noise as possible. The tray glides open when summoned, and there’s barely a whisper of the machinery whirring inside as the CD or Blu-ray starts playing. The display itself is simple, crisp and clear, with a large font that’s easy to read from afar. It’s a shame it doesn’t show the sampling rate or file type of the music you’re streaming, or any additional information beyond the track or input name when playing. Even the remote control is high quality. We don’t often come across remote controls that feel quite so nice to hold and use, so please indulge us while we sing its praises. The soft-feel rubberised finish is lovely in your hand, the buttons are sturdy and click satisfyingly, and it responds swiftly with the unit. It’s backlit, too, which is always useful when in a darkened cinema room. We just wish there were dedicated buttons for each input on the remote. Repeatedly pressing the single input button to get to the input you want to select can be time consuming. But if that’s the only quibble we can find with this disc player, the CXU has nothing to worry about. With Birdman playing on Blu-ray, we’re treated to a gorgeous picture that looks natural, crystal clear, and full of subtlety and dynamism. Colours are faithfully portrayed, with skin tones and daylight scenes having a realistic touch, while also brimming with vibrancy and crisp detail. The interplay of light and shadow is expertly done. The sunlight coming through the windows is clean and intense (but never glaring), while the gradient of shadows in gloomy hallways is deftly conveyed. Dark scenes are pleasingly deep, without swallowing up finer details or robbing the scene of depth or drama. Motion is handled smoothly, whether you’re watching a fast action scene or a slow panning shot. The CXU handles Birdman’s dizzyingly choppy edits and camera swings with confidence and control. A glossier film like Guardians of the Galaxy bursts with punchy colours, rich detail and strong contrast. Objects are drawn crisply, but it never looks overly sharp or unnatural, even when dealing with CGI spaceships and MacGuffin magic gems. The CXU resolutely holds on to its punchy contrast and natural colour balance even when playing DVDs. There’s the usual dip in resolution when playing the DVD of Stoker, but there aren’t any intrusive blotches of noise. It’s a stable, detailed picture. The CXU’s immediate rival, the excellent and class-leading Oppo BDP-105D (£1100), is similarly adept at delivering a natural and lively picture. However, the Cambridge is noticeably crisper and subtler with detail, which keeps us further glued to what we’re watching. As enjoyable as its picture performance is, the Cambridge CXU really lets its true colours fly with sound. With a natural proclivity for taut, well-timed rhythms and a fluid, musical presentation, it makes film soundtracks arresting, immersive and full of impact. With two-channel music, its talents are even more obvious. Set Leonard Cohen’s Popular Problems spinning on CD and the CXU delivers a richly detailed, spacious and melodic performance. The bouncy, seductively deep and rumbling bassline on Almost Like the Blues is stunningly taut and controlled. The top end is clean and notes soar without ever sounding bright. Vocals are clear and expressive: the smoky, growling texture of Cohen’s deep baritone conveyed with insight and clarity. Each instrument is easily identifiable in the spacious soundstage. Notes stop and start with precision, but the Cambridge never sounds too analytical. It’s too busy delivering the most musically cohesive and engaging sound – and it’s a joy to listen to. The CXU doesn’t make a fuss about the file type or recording quality, with Marcy Playground’s grungy tones on Comin’ Up From Behind given the same amount of enthusiasm and insight as with high-resolution tracks. However, play a pristine recording like Popular Problems and the CXU shines. Once again, the comparison with the Oppo player proves telling. While rich and full-bodied, the Oppo player’s low-end performance isn’t as grippy or precise as the Cambridge’s. The CXU is also a livelier, more enthused and insightful player. The CXU supports a wide range of disc formats, including 3D Blu-ray, CD, SACD, DVD-A, and even the rare HDCD and AVCHD. In case you’re wondering, no it doesn’t play HD-DVD. It supports playback of all popular file formats too, from MP3 to ALAC, WAV and FLAC, and up to 24-bit/192kHz high resolution. You can also play DSD64 files, but only through the USB inputs. All four HDMI ports on the CXU – two for input, two for output – can play Full HD resolution. Both HDMI outputs feature ARC (Audio Return Channel), while the front HDMI port supports Mobile High-Link Definition (MHL) so you can directly play HD content from Android smartphones. You’ll also find coaxial and optical inputs on the CXU’s back panel, as well as a pair of analogue stereo outputs and a 7.1 multichannel output. If your music and video collection is stored on hard drives or USB sticks, simply plug them into any of the three USB ports. One of the CXU’s bonus features – and a very useful one too – is that all three ports can also charge your Apple or Android smartphone. The talented CXU is also a network streamer. You can connect it to your home network using the ethernet port, or go wireless with the supplied wi-fi dongle (which plugs into any of the three USB ports). There’s no dedicated app for the CXU, so using the simple on-screen menu and remote to access your NAS drive’s files is the easiest way to stream. Alternatively, you can download third-party apps if you prefer using your tablet or smartphone to scroll through your music library. Unlike its rival Oppo BDP-105D, Cambridge doesn’t have Netflix or BBC iPlayer built in. It does have YouTube and Picasa, but those smart apps pale in comparison to everything else that the CXU can do. The CXU is a pricey investment at £900. But when you consider there are very few machines that can play movies and music at such high quality, and that all this is contained in one box, it doesn’t seem quite so steep. As a player that does it all, the Cambridge CXU impresses on every level.